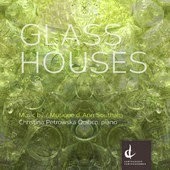 Canadian composer Ann Southam passed away while her friend and associate, pianist Christina Petrowska Quilico, was working on performing the pieces that ended up as Volumes One and Two of Glass Houses. Volume Two is now out (Centerdiscs 20114). These were written some years before but sound as current as ever. Quilico gives us definitive, rhythmically charged renditions of "Glass Houses 8, 10-12 and 14". I covered some of Southam's posthumously performed piano music last April 24th, 2013 on these pages, and what was true of that recording is even more so of this. This is a kind of minimilism but very much of Ann Southam's original own. The works generally have an ostinato pattern of chordal-melodic figures for the left hand that tend to be in an irregular meter. The right hand contrasts these recurring figures with a melodic development that articulates a different and sometimes shifting meter. The melodies are not generally cosmic passagework, which conventional first-school minimalism might tend to favor, but rather have more conventional a-b-a-c, etc., structure. This makes the music stand out as more than interesting interlocking patterns, which it is in any event, but something more through-composed as well as performative. And so this music tends to stand out for its rhythmic vibrancy (which is substantial) AND its melodic distinctiveness. Interestingly enough Keith Jarrett in his solo concert mode would sometimes get into something like this during the middle period, but he never really worked the idea out as a melodic-compositional entity that could stand on its own. The cross-rhythmic push and the melodic sculpting that Ms. Southall develops here were never worked out consistently or palpably in the Jarrettian moment. For that we have these wonderful Southam works. She develops an idea that was "in the air" so to speak and makes it into a lasting art of great merit. Ms. Quilico gives us about as definitive a version as we are likely to get for some time. She has the rhythmic independence between right and left hands and the inherent pianistic artistry to make it all sing.